How Do Lasers Help with Brown Stretch Marks? Are you living with unwanted, embarrassing stretch marks? This difficult condition is all too common and unfortunately, can affect anyone. Both men and women suffer with stretch marks; often they appear at vulnerable times in our lives like during puberty or pregnancy. But if you’re suffering with stretch marks, there is help. Typically, stretch marks are red, brown or silver/white in appearance. Darker colored stretch marks are usually newer, whereas older stretch marks are silver or white in appearance. If your stretch marks are brown or hyperpigmented, you likely have a darker skin type (color). Brown stretch marks are difficult to hide because they stand out so much from your natural skin tone. 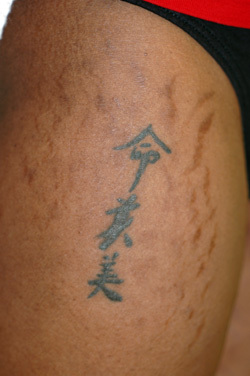 Unlike red stretch marks, which usually fade to the white/silver color with time, brown stretch marks often don’t. One of the most frequently recommended treatments for dark stretch marks is bleaching creams with hydroquinone or exfoliants. While these sound like they might work for dark stretch marks, they usually don’t. Hydroquinone is a bleaching or “fading” agent that when applied to the skin slows down the excess production of melanin or pigment. Sounds like exactly what is needed, right? Well, not really. It takes a very, very long time for hydroquinone to work; and when combined with Retin A, can be extremely irritating to the skin. Many patients have trouble using it long enough to see the full benefit. It also shouldn’t be used for extended periods of time. An alternative, and we believe better treatment option for brown stretch marks, is class IV medical lasers. Specifically, q-switched YAG lasers work well by targeting and breaking down excess pigment in your skin. Remember, brown stretch marks become hyperpigmented because the excess pigment in the cells caused by the trauma to the skin when stretch mark is formed. Q-switched YAG lasers can be used to gently and effectively break down excess pigment so your body can remove it on its own. Nd:Yg (Yag) lasers are safe to use on any skin type (color). They gently heat the skin during treatment, and we’ve found that this provides improvement in the texture of stretch marks by stimulating collagen production. Treatments are generally quick, but require a series of at least three to five spaced four weeks apart to see maximum improvement. Most of our patients tell us that they see positive changes after several treatments! It’s important to know that laser treatments like these cannot completely erase stretch marks. There’s no perfect treatment that can make your skin look as if you’ve never had stretch marks, however, significant improvement is the goal. Call us today to learn more about treating dark stretch marks.